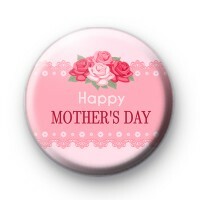 Pink Roses Mothers Day Button Badge. This is a 1 inch pin back badge and is the perfect handmade gift for any Mum. Let your Mum know how much you love and appreciate her.